25 years’ lease was given to this company to develop French territories and the Mississippi in North America. It was a clear license to exploit the rich territory of Mississippi as it was watered by the Mississippi river. The deal required that 6000 French citizens and 2000 slaves were required to be settled in the territory. This was not enough as the company was given a monopoly for growing tobacco and selling of tobacco also. Sweet! The company became known widely as Mississippi Company. Earlier its stock was bought only with the down payment of 10%. Rumors were spread that, a beggar who invested the saving in this scheme, made 70 million livres when he cashed out. Later John Combined his bank and Mississippi Company and he changed the name of the Bank from ‘Banque General’ to ‘Banque Royal’. Duke d’Orleans bought the stakeholders in the bank and made it the royal institution with sole stakeholder. Soon notes of Bank Royal were made a legal tender throughout the France. In fact, John Law was appointed The Controller and General of the France. This is the first note of Banque Royal. This note was signed by three higher officials of the bank. In early 1700 it was believed that the Mississippi region was rich in silver and fur and variety of crops were used to farmed in that area. Few attempts were made to civilized in these areas but due to insufficient funding these attempts were made failed as it was difficult to find labor for harvesting crops. However, to change this situation one of the greatest real estate promotion in the history were initiated with the blessing of the John Law and hearing this news French artist who had never visited any other place than Paris, painted the New Orleans as if it was The French Riviera!! Law came with a simple but effective strategy!! He stated that with the infusion of capital and slave labor from the home area they could easily start their business there!! 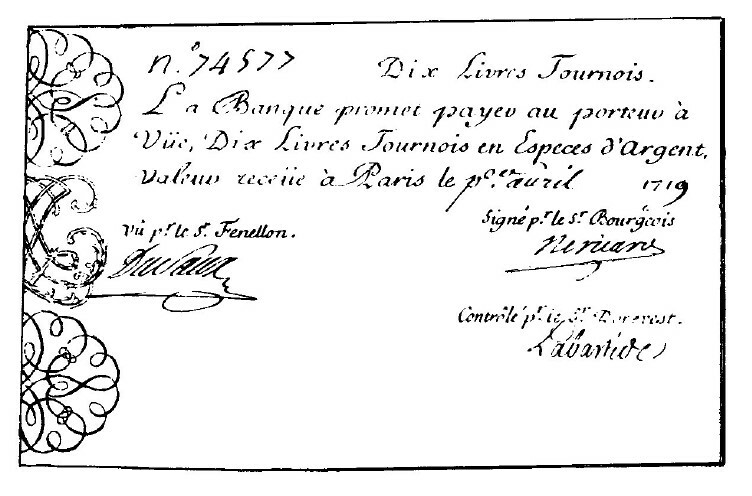 And the source of capital was none other than ‘The Banque Royal’. The area of the Mississippi was already depicted as a paradise and hence when Law announced his proposal to exploit the resources of Mississippi, it created an interest in the people of France and Europe. The marketing was so effective that it leads to the wild speculation of the shares of the company. These shares were originally issued at 150 Livres but later in a few months rose to 10000 Livres anticipating the huge profit in the investment! It was already known to the people that Mississippi and Louisiana would become a large tobacco growing regions but when it was rumored that Gold and Silver were discovered in Mississippi region the share prices rocked up to 18000 Livres and in the same year i.e. January, 1720 the company declared the dividend of 40%. In cities like Paris, Lyons, Tours and Amiens various branches of Banque Royal were set up to facilitate the issue and redemption of bank notes. Later to issue the notes to general public became the chief function of the bank. By the mid of 1720, the proportion of these notes in the market was too high that it caused a rise in the inflation. The people who were blind believer of John law that he would make them rich, clamored to get their hands on the bank note issue. The streets of France became crowded just to buy the shares of the Company. Even the working middle class was seeking for the shares of the company. People after giving 10% deposit, borrowed money from the market and invest the same for buying the shares of the company. Many people became rich after the selling their shares for a higher price. Everyone was investing their money, though a small amount just to earn more profits!! !